You are here: Home / Nature Journaling / Donna's nature journal / Insects Head, Thorax, and Abdomen – drawing to learn. I confuse an insect’s abdomen and thorax every time. I think it is because my abdomen is in the middle of my body, so I think the middle section of an insect should be an abdomen, too. 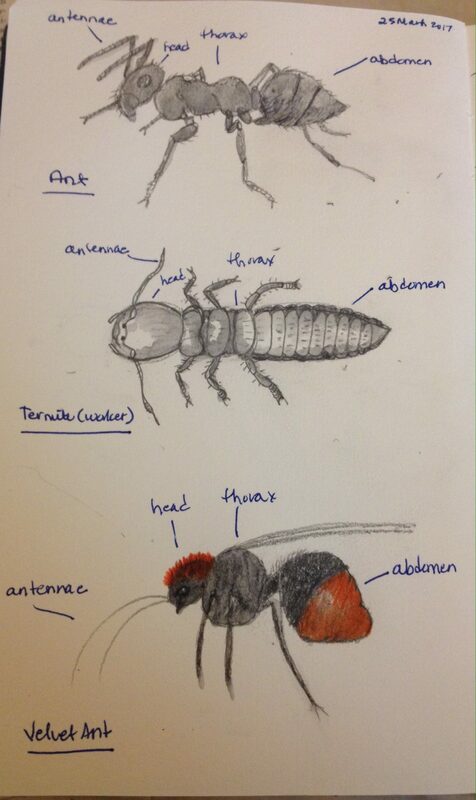 I am drawing these three insects in my nature journal to help me remember. I realized while drawing the ants that I can’t name the ant species that live in my garden. This sounds like a summer project. What are you thinking of learning about as the spring and summer seasons begin? Very interesting! Love your velvet ant, good artistic choice! Want to study all the noisy insects this summer, and learn to differentiate their songs! Happy Spring! Thanks Mary Beth. I would love to name the night insects, too. I have a night sounds cd I use when I want to identify a sound.